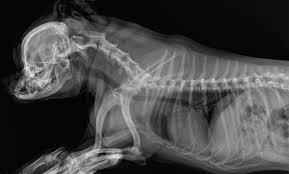 At Collaroy Vets, we have comprehensive radiology (X-Ray) capabilities that use digital technology. Digital radiography is a form of X-ray imaging, where digital X-ray sensors are used instead of traditional photographic film. It allows us to obtain image resolution that is higher than older, film based systems. Higher resolution imagery provides more information to our doctors, allowing for a more thorough analysis. Images obtained with this technology are processed within seconds, yielding high quality diagnostic images with decreased radiation exposure and increased efficiency. Instead of X-ray film, digital radiography uses a digital image capture device. The images are created and stored using a medical imaging standard (Digital Imaging and Communications in Medicine or DICOM) that provides secure files which can be viewed by all DICOM compliant software. When a specialist is required to interpret radiographs, these images are sent electronically via the internet which reduces the time required to generate a diagnosis and at less expense to our clients. Our patients benefit from digital radiography because images are easier to take and the completed image generates within a second. Studies are done quickly and patient fear and/or discomfort is significantly minimised. Digital radiography enables us to practice better medicine at less expense to our clients and greater comfort to our patients.